Last week, I shared a meme about GMOs on my blog’s Facebook page, and several people responded by arguing that genetic engineering (GE) shouldn’t be used because “it bypasses the natural evolutionary test of fitness.” I’ve heard this argument before, and it is basically just a dressed-up appeal to nature fallacy that asserts that something that has undergone natural selection will somehow be better for us than something that has not. That notion is, of course, ridiculous. It has all the problems of a normal appeal to nature fallacy, plus it relies on numerous misconceptions about evolution, GMOs, and agriculture in general. So, let’s take this one step at a time and go over why this argument doesn’t work. This first, and perhaps most obvious, problem with this argument is that it assumes that nature is somehow looking out for your best interests. It implicitly asserts that natural selection is acting on fruits and vegetables to bring about a result that is beneficial for you. In reality of course, nothing could be further from the truth. Natural selection is nothing more than a sampling bias that operates off of two simple premises. 1). There is heritable variation for traits (i.e., different individuals have different genetic material [alleles] for a given trait, and they can pass that genetic material on to their offspring). 2). That variation affects individuals’ ability to pass genes on to the next generation. When those two conditions are met, individuals with beneficial traits will pass on more genes than individuals who lack those traits, and, as a result, those traits will be more common in the next generation. That’s it. That’s all it is. You will notice, however, that those two requirements have absolutely nothing to do with you or humans more generally. There is no third requirement that states that a given trait has to be beneficial for humans. Indeed, your needs have no bearing whatsoever on the evolution of other organisms. You’re not that important. This should, of course, by blatantly obvious, because nature is full of things that are utterly terrible for humans. Consider mushrooms in the genus Amanita for example. They produce chemicals known as amatoxins that are extremely toxic to humans at anything but an incredibly low dose. If you eat a single one of these mushrooms, you will spend the next 24–48 hours with agonizing abdominal cramps, as well as fluids gushing uncontrollably out of both ends of your digestive system. Your only escape from this will most likely be the sweet release of death when your liver eventually shuts down. There is currently no known antidote for amatoxins, and doctors can’t do much for you other than keep you hydrated (or if you’re really lucky, give you a liver transplant). Now, why would nature produce something so terrible? Because it doesn’t give a flying flip about you. The genus Amanita evolved to be deadly because that is what was beneficial for it, not because of what would have been beneficial for you. Mushrooms that produced a toxin where eaten by animals less frequently than mushrooms without the toxin, and, therefore, survived longer and produced more offspring. As a result, the genes for toxicity became more and more prevalent in the population, until we eventually got the horrifying product that currently grows in our forests. That’s it. That’s how natural selection works. You’ll notice, however, that this supposed, “natural evolutionary test of fitness” had nothing to do with you. It was about the organism that was adapting (i.e., the mushroom) not the organism that was looking for food (i.e., you). Note: I want to make it clear that although we talk about natural selection as benefiting organisms, it is only acting on the available genetic variation, and it can only adapt populations to their current environment. It does not have any foresight and it does not give organisms what they truly need. More details here and here. Note: It is true that there are mutualistic relationships in which two organisms evolve together, but those only occur when the organisms are directly interacting, and even then, nature is not trying to adapt one in a way that is beneficial for the other, rather it is all about the organism that is adapting. For example, hummingbirds rely on nectar from flowers, and, in many cases, plants evolved to produce nectar for the hummingbirds (and other pollinators); however, that evolution did not take place because it was good for the bird. Rather, flowers that produced nectar were visited by the birds, and the birds happened to pick up some pollen while they were there, and that allowed the plant to produce more offspring. So, the plant didn’t evolve to produce nectar because it benefits the bird. Rather, it evolved to produce nectar because that ultimately benefits the plant (benefiting the bird is merely a means to that end). Further, organisms are constantly trying to “cheat” and even in these mutualistic relationships, there is usually an evolutionary arms race where each organism tries to game the system. Finally, humans do not have this type of shared evolutionary history with most of our crops (see next point). This is what a wild banana looks like. Nature’s version doesn’t look as tasty as ours, does it? The next major problem is the simple fact that our crops were produced by artificial selection, not natural selection (i.e., they were made by the same process that made the Chihuahua, not the process that made the wolf). Because nature is a jerk that doesn’t care about humans, we had to step in and make the crops ourselves. We took the small barely edible products of nature, and over thousands of years of careful breading, we modified their genetic codes and transformed them into the large, delicious items that we consume today. 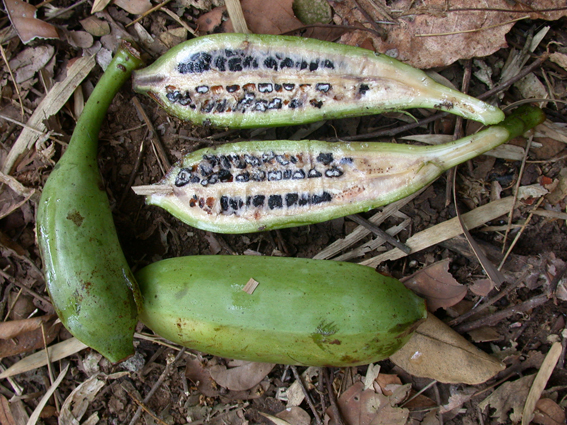 Wild bananas, for example, are small and full of giant seeds. Similarly, wild corn (teosinte) does not produce the large cobs that we consume. Indeed, virtually none of the items on our produce shelves can be found in nature. Now, at this point, you might be tempted to assert that the fact that we have been the ones selecting the crops actually makes the argument better, because surely we would not select a trait that is harmful. However, that response ignores basic concepts of genetics. You see, when you select a trait, hybridize crops, etc. via traditional breeding techniques, you don’t just exchange the genetic code for trait that you are interested in. Rather, you exchange genetic information across the entire genome. Thus, you alter thousands of traits, not just the one that you are interested in. Imagine, for example, that you have two crops, one of which is small but drought resistant, and the other of which is large but not drought resistant. Now, you want to get the drought resistant trait into the large crop, so your cross breed them. This succeeds, and the genes (technically alleles) for drought resistance get moved into your large crops. However, thousands of other alleles also got moved. So, while you were after the drought resistant ones, there may have also been genes for producing a deadly chemical, allergen, etc. that you just moved without ever knowing it. Note: when I say, “deadly chemical” or “toxic chemical” I mean deadly/toxic at a low dose. The dose makes the poison, so everything is toxic at a high enough dose. Indeed, this is essentially what happened with the Lenape potato. It was bred for traits like low sugar content, but it was eventually discovered that it also produced high levels of the chemical solanine. This chemical is normally in potatoes, but usually it is at a low enough dose to be safe (unless you eat unripe potatoes), but the levels of it were unusually high in the Lenape potato. Indeed, they were high enough to make people who ate it nauseated. How did this mistake happen? Quite simply, the potato was selectively bred for one trait, but in the process, the breeders accidentally and unknowingly selected for an additional trait (high solanine levels) that was harmful to humans. 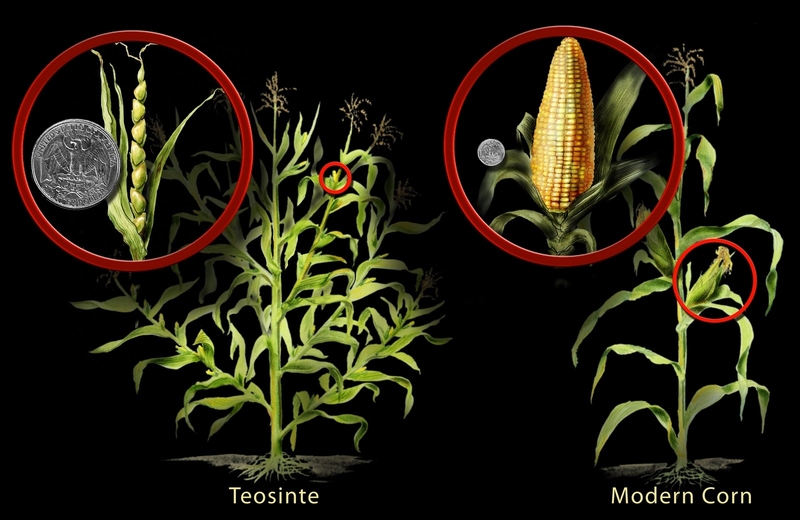 Even when it has been organically grown, the corn that we eat is not natural, and it is quite different from wild corn (teosinte). Our crops have been genetically modified via thousands of years of careful breeding, and the fruits, vegetables, and animals that we eat today contain novel genetic codes that are not found in nature. Image via mentalfloss.com. This is one of the huge advantages of genetic engineering: it is precise. With GE, you could take the specific genes for drought resistance and move them without moving any other genes! As a result, GMOs should actually have fewer unintended consequences than traditional breeding methods (and studies have confirmed that they have fewer than mutation breeding methods). To put that another way, both breeding methods involve moving the DNA from one organism to another (sometimes even across species, e.g., hybrids), and the only important difference is that genetic engineering allows you to be precise and move only the genetic material that you are trying to move. Further, we can even use GE to correct mistakes that have arisen during traditional breeding methods and/or natural selection. For example, when fried, traditional potatoes release a chemical called acrylamide, which is a suspected carcinogen (like I said, traditional breeding methods and/or natural selection can result in nasty unintended consequences for humans). Thanks to GE technology, however, we have now produced a GMO potato that doesn’t produce that chemical. Further, that technology allowed us to knock out that one specific trait without screwing with any others. By any reasonable standard, that is a good thing and makes GE far superior to traditional breeding methods. To sum all of this up, nature is not your friend, and the fact that something evolved naturally does not in any way shape or form guarantee or even suggest that it is good for you. Species evolve the traits that are beneficial for them, not the traits that are beneficial for you, and natural selection has produced some of the most horrifying things imaginable. Further, artificial selection and other breeding methods (e.g. mutagenesis) also do not guarantee a safe product. All of them involve altering the genetic code, and that always has the risk of unintended consequences. Genetic engineering is different from these methods in only one important way. Namely, the changes that it makes to the genetic code are more precise. So if we are going to worry about an unintended consequence from changing the genetic code of an organism, surely we should be the least concerned about the method that makes the fewest and most precise changes (i.e., GE). This entry was posted in GMO and tagged appeal to nature fallacies, Bad arguments, evolution, evolution is blind, GMOs, Safety. Bookmark the permalink. A very commonsensical and cogent explanation. Many thanks for it. Get the facts before making decisions. Mushrooms that produced a toxin where eaten by animals less frequently than mushrooms without the toxin, and, therefore, survived longer and produced more offspring. I always wondered how that works in nature. An animal cannot be treated for poisoning and survive to know not to eat the mushroom, or to tell its offspring not to eat it. And by the time the animal has died, the mushroom has already been eaten and its toxin genes cannot be passed down to the next generation. There are multiple ways that this can occur depending on the species. For example, sometimes it works because some animals learn from watching other animals (this has actually been documented with poisonous butterflies and birds, for example). In other cases, it works because the effects are sub-lethal for some species. Indeed, there are actually species that are totally immune to amatoxins. Eastern box turtles (Terrapene carolina carolina) for example, eat them regularly, and they can actually retain the toxin in their tissues and become poisonous themselves (without experiencing any ill-effects). In fact, there are multiple reports from the Great Depression where people were so hungry that they started eating box turtles, and ended up getting poisoned from the amatoxins. Sorry, I got a bit off topic there because I really like box turtles (I used to do research on them), but the point is that although turtles are immune now, it is easy to imagine a slight mutation to the mushroom that would alter the toxin such that it is not lethal to the box turtle, but makes them sick and, therefore, makes them less inclined to eat it again. So, in some cases, extreme toxicity to one species may actually be the result of an evolutionary arms race with a different species that is more tolerant of the toxin. Just to be clear, I’m not suggesting that box turtles are actually the species that drove the evolution of toxicity in Amanita, they are just an example of a species that is tolerant to the toxin. It’s also worth mentioning that in the specific case of fungi, the mushroom is actually just the fruiting body of a fungus. The main body itself lives in a large mat of mycelium underground (kind of like roots for a plant). So, when you see a fairy ring or other mushrooms popping up close together, it is actually one individual, with multiple fruiting bodies. Indeed, sometimes the organisms itself can be huge. The largest known one lives in the western USA and is nearly 2.5 miles (almost 4km) in diameter, making it the largest living organism on earth! All of that is simply to say that picking and eating a mushroom is like picking and eating an apple. You’re only destroying the fruiting body, and the main organism lives on. Nevertheless, picking that fruit/mushroom is still harmful to the organism because it took energy and resources to produce the fruit/mushroom, and those fruiting bodies were intended for reproduction, and you just interfered with that (unless, of course, you are a species that is effective at dispersing seeds/fungal spores, as some species are). I think that this ‘evolutionary test of fitness’ is one of the most common misconceptions about evolution, as it evokes an image of each individual organism being somehow tested for fitness after being born/hatched/germinated, resulting in culling ‘unfit’ individuals from the population in a matter of perhaps one or two generations. In reality, it is very often a subtle, statistical process that takes lots of generations to produce visible results. Only when humans do the selection, you get this fast-track, rigorous ‘test for fitness’ — and even then it may take quite a few generations to get true breeding for a desired trait. Even where real evolutionary testing of fitness applies (i.e. without human intervention), one typically gets generation after generation of ‘less fit’ individuals that only slowly disappear from the population, barring sudden cataclysmic changes in the environment. And, as you point out quite emphatically, this still has nothing to do whatsoever with fitness of the organism for our purposes as human beings. I think you’re kind of misrepresenting this with the least credible interpretation. When I read the comment I see it implying that humans evolved to eat the naturally selected fruits in their environment. Which still doesn’t check out because not only do we eat artificially selected food but it’s often times more healthful than what you would find in nature. than this one: Natural plants evolved to be beneficial to us.